I actually knew better, but I didn’t know what to replace these thoughts with since I have never really cooked outside of the U.S. I was in the habit of shopping at three different stores on Saturdays and obtaining all the ingredients I would need for the week’s meals and the fulfillment of my cooking addiction. Now, five years later, I stare stupidly when confronted with any North American supermarket, and don’t have a clue what I might buy or cook, though I have become quite expert at shopping and cooking in my new home. I learned that “seasonal” in Belize actually means “seasonal.” If it is out of season, you cannot obtain it. If it is “in season” it is abundant, cheap, and unbelievably good. Next, I realized that “fresh” actually means “this just came out of the ground this morning.” The first time I ate fresh carrots in Belize, I could not believe how good they tasted. I was always taught that one should buy the skinny, unblemished ones for the best taste; but these were about the size of a cucumber, and had some spots on them. On the mainland of Belize there are wonderful, huge markets that carry every seasonal vegetable and fruit, fresh fish, and meats from one of the three or four suppliers in the country at exceptionally low prices. Living on an island means that all food has to be barged or brought by boat, which adds a bit to the cost. Most grocery stores carry dairy, canned food, and dry goods. 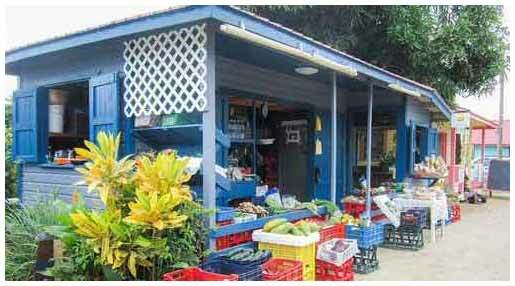 Fresh food is obtained at small indoor and outdoor stands which mostly take delivery from the farms on the mainland by boat early on Tuesday and Friday mornings. These same farms supply most of the dairy and chicken as well. Meat and fish on the island? You need to know where to go, and at what time. Meat can be purchased in most grocery stores and is always frozen. If you want meat fresh, there is a great meat market in downtown San Pedro, and another outlet for this market about a mile south of town. There are no flashy signs to guide you to this outlet, it is just a plain Quonset hut, and they close for three hours in mid-afternoon; but the meats are wonderful and they will cut them to your specifications. It’s important to develop good relationships with the grocers and suppliers you use on a regular basis. I loved doing this, and some of them have become dear friends. I learned that if there is something I really want, but never see, I can request it, and it will show up in the next shipment, saved just for me. I also get the locals’ discount at my usual shopping places and get to hear the latest from the “coconut telegraph” about upcoming events or changes on the island or in the country. When I shop for food, I return home feeling a part of the community I love, and my overall food budget is much lower than in the States since I learned to shop like a local. I spend about $350 to $400 a month for two people, and we eat about twice as much fruit and vegetables as we once did. I never imagined that food shopping would become something I enjoyed as much as I do in my new home, and that cooking and eating so much fresh food would be such a pleasure.